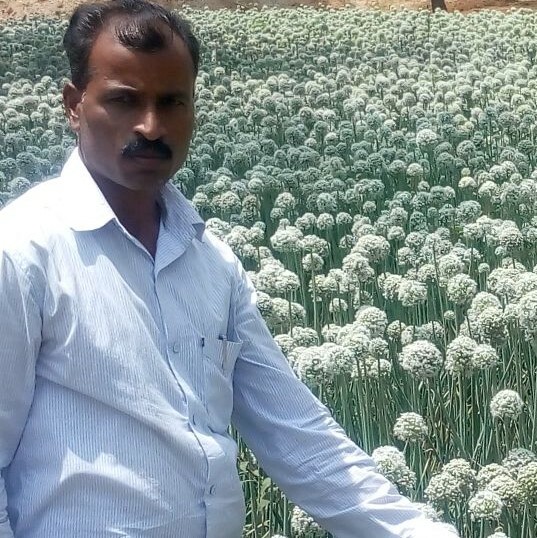 “I used to buy onion seeds for my farm and found it very expensive. I used to pay Rs. 1,500-2,000/kg so I started producing my own seeds. After a while other farmers also started asking for seeds thus slowly and gradually I began producing onion seeds commercially,” says Mr. N. Revanna, onion seed supplier. He supplies seeds to 350-400 farmers. His 5 hectares farm is located at Hosakunduru village, Chitradurga district, Karnataka. “I completed Bachelors of Arts and took up farming because I realized I could work best in the soil. In the beginning I was cultivating cotton and the returns were nominal. However on the advice of a friend from Hiriyur, Chitradurga district, I switched to onions to get higher crop yield. And now since last 20 years I am into onion cultivation and seed production. I also grow other crops on small scale,” he adds. Seasonal vegetables grown are brinjal, tomato, chilli and sweet corn. Farm also has Raichur jowar, Bengal gram, tur dal and pomegranate cultivation. First and foremost Mr. Revanna was growing desi onion namely Garva and Roganimbakaru but later he switched to Arka Kalyana and Bheema super variety of onion. 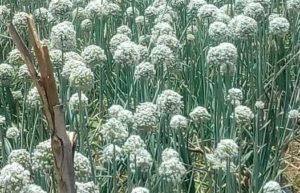 “With the help and guidance from Babbur Horticulture department I have started cultivating these super onion varieties. They gave us 2 kg seed free of cost to check its performance in the fields. During the trials the varieties performed well in our soil with good yield, better quality onion and disease resistance. Then after many farmers started using it,” he shares. The farmland is nourished with cow dung manure with trichoderma and pseudomonas mixture for seed productions. In one acre 20quintals tubers are needed. “The tubers are sown at a distance of 6inches from tuber to tuber. Later after sowing, first irrigation is done manually then with sprinklers. Once the onions sprout it is irrigated with drip lines. It will sprout in 10days,” he elaborates. To manage the pest in onion seed production sweet corn is grown on the farm boundary. The sweet corn plants grow high and secure the onion plants from pests and insects. “The onion tubers are fenced with three rows of sweet corn to avoid the entry of insects. It will break the flow of breeze and keep the onions tubers safe. Sweet corn is planted at the distance of 4 feet from onion plant in 3 rows. 5kg corn seed is used that yields 4 quintals corn and leaves for cattle fodder. To improve the onion seeds yield honey bees box are kept during flowering sourced from horticulture department (free of cost). The bees help in pollination and good yield is obtained,” he states. In one acre, the production cost incurred is Rs. 80 thousand. The yield obtained is 4-5 quintal seeds. By the end of March, seeds are harvested. One tuber will give approximately 50-100seeds. The size of the flower decides number of seeds produced. If the tuber is treated well with manure and bees boxes are kept in the farm then 150-200 seeds per flower is obtained. Seeds are sold to the farmers across Karnataka at Rs. 500, 1000, 1500 or 2000/kg. “If the seed production is good then price is reduced,” assures Mr. Revanna. Seeds are also sent through courier as required by the farmers. Seeds can be sown directly in the soil as preparing the nursery plants will be more expensive for the farmers. “Germination rate of my farm produced seeds is almost 95%,” he claims. In one acre 5kg seeds are required. The unsold seeds are stored in air tight containers. “The containers are kept in cold storage at Akshaya Food Park, Hiriyur for 5-6 months. Rs. 2000-3000/quintal is paid as rent. If I keep seeds at home the seed germination rate reduces by 25%,” he shares. To improve onion yields Mr. Revanna advices farmers to focus on land preparation and using drip irrigation. “To prepare the land for onion cultivation, 15 days before mix 2ton cow dung with 4kg trichoderma and pseudomonas. Ensure to keep the mixture moist. Water the land and add manure mix to the soil. A week later add bio-fertilizer in the soil, sow the seeds. Put sticky traps to attract the insects. In case of any trips or other pest spray the neem based herbal solutions. Irrigate the farm with drip system,” he explains. In future Mr. Revanna wants to form Onion Growers Sahakari Sangha and create a brand name for his farm produces to get the recognition in the market.